The National Development Plan 2006-2010 set out economic policies designed to “contribute to the shaping of the productive matrix in order to change the exclusionary nature of the primary export model”. The model is made up of two sectors: those producing a strategic surplus and those that generate employment and income. Agricultural development was classified as being within the ‘employment and income generating sector’. Among the tasks that needed to be addressed were resolving inequality in land distribution, its excessive fragmentation, land degradation and the destruction of biodiversity. The plan considered these as underlying causes leading to subsistence livelihoods among wide sectors of the indigenous peasant population in Bolivia. The Plan proposed the structural transformation of agriculture. This would involve as a priority the titling of 56 million hectares of land and the distribution of a further 20 million hectares to the indigenous peasant population. The plan also envisages the establishment of a system of land administration, a land registry, a land tax system, and greater equity in land distribution. It advocates policies to revive community capacities on new settlements, both communities and territories, supporting collective land management. In terms of landholding, the National Development Plan formalised longstanding indigenous and peasant demands. 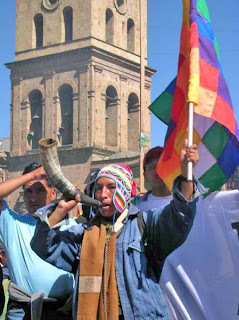 These had been voiced in previous years by marches to La Paz. They included the demand for territory as well as the push for a constituent assembly. On 28 November 2006 the Ley de Reconducción Comunitaria de la Reforma Agraria (Law 3545) was promulgated, defining, in specific terms agrarian policy as one of structural transformation in agriculture, bringing about a rapid and massive redistribution of land and providing [the beneficiaries] with legal security. Land would be redistributed primarily to indigenous peoples and campesinos on the basis of a revision of land titles for medium and large rural properties where the requirement that land is used for social or economic purposes is not being upheld. Since then many important things have been achieved. The political deadlock with the departments of the media luna has been resolved; the new constitution was approved (in 2009) establishing a plurinational Bolivia; and elections in 2009 were won with a close to 2/3 majority of the votes. Up until 2010, the results were eloquent in agriculture: 55 million hectares of land were surveyed and titled (51.5% of the national territory). Of these, 21 million were titled as indigenous TCOs (in the lowlands) and TCOs in the highlands. 7 million hectares were given as collective or individual titles to campesinos. 21 million were declared as state land (tierras fiscales), and 6 million awarded to medium and large businesses. It’s important to note that these figures are cumulative; of the 55 million, 9.3 million hectares related to previous governments (since 1996) and 45.7 million hectares to the government of Evo Morales. As for the tierras fiscales, it was the first time in Bolivia’s history that these were put under state control. Of the 21 million hectares of land certified as such, 15.2 million enjoy legal protection (protected areas, forest concessions etc.) and 5.9 million were made available for distribution. Up until 2010 1.3 million hectares were distributed for 190 communities with 8,300 families as beneficiaries, which means that there were then 4.6 million hectares available for distribution. Between 2006 and 2009, 31.5 million hectares were surveyed and titled, of which 15.7 were awarded to indigenous communities and campesinos. Of the total 31.5 million, 10.8 million were made available from land taken over because of the failure of its owners to comply with the economic and social function. Of this, 3.94 million hectares were subsequently redistributed to indigenous and peasant families and communities, benefitting 56.679 families. The number of beneficiaries has increased since then. Of a total of 153.566 beneficiaries between 2006 and 2009 15.5% were single women and 57.21% were titles given jointly to women and men. This constitutes an unprecedented advance in the recognition of property rights in favour of women. For land where titles are held collectively - which is the case for the largest extensions of land - verification is needed to see whether or not this right is being upheld. Such changes in landholding are at risk, however. Progress in land surveying has reduced to such an extent that the current total land surveyed and titled is 62.8 million hectares, an advance of just 7.8 million in the last year and a half. At this pace it will be impossible to meet the target of 108 million hectares set for November 2013, by Law 3545. While the total amount of tierras fiscales has increased to 23.3 million hectares with 6.1 million hectares available for distribution, the amount of state land actually distributed in this period was just 100,000 hectares. The increase in the number of conflicts over land and the increase in land invasions would not be happening if the state was making land available for distribution. There are clear signs that not only has the process of agricultural transformation stalled, but that there is the risk of it being reversed. They include the presence of representatives of large private landholders in spheres of policy making; the strong push being made by sectors of the campesinos against collective indigenous lands; and official complicity in the occupation of tierras fiscales. If the government agrees to proposals made by the business community that there should be a halt in the process of verification as to whether land is fulfilling the economic and social function for medium-sized and large properties, it will be giving in to practices of slash and burn used illegally on the pretext that food is being produced. Also at risk are the collective rights afforded to indigenous territories, under the argument that their populations are very small and that illegal settlements are acceptable and even that they should be promoted. This sort of regression would be equivalent to what took place in the wake of the national revolution when the state ended up doing exactly the opposite of what it promised in agrarian reform.